DynaMed now includes more than 500 clinical calculators, decision rules and statistics calculators to give clinicians even more decision making tools to use at the point of care. Find tools such as decision trees, units & dose converters, clinical criteria, and math calculators. Most calculators include information to help you interpret your results, as well as references to the literature, and allows for searching by specialty. After logging in, click on Calculators in the upper right area of the screen. "Global Health is the only specialist bibliographic, abstracting and indexing database dedicated to public health research and practice! Derived from over 3500 journals, plus reports, books and conferences, Global Health (CABI) contains over 1.2 million scientific records from 1973 to the present. Over 90,000 records added each year, and over 95% of these records include an abstract. Publications from over 158 countries in 50 languages are abstracted,.. and 40% of material is unique to the database." Thank you to a wonderful group of American fiction writers for their generous donation to the Anne Ross Library! 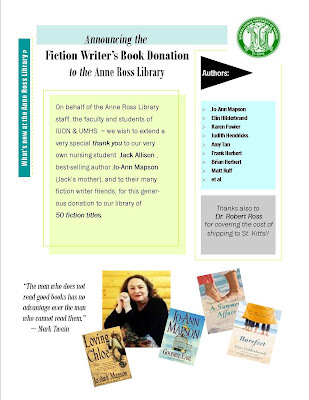 A special thanks to our own IUON nursing student, Jack Allison for all his effort to make this happen, and best-selling author Jo-Ann Mapson for calling on her author friends and coordinating the donation state-side! Thanks also to Dr. Ross for providing shipping to St. Kitts! The collection is now available for check out, so come and see the display. Study Anatomy with the WinkingSkull !! Thieme Publishers offers this great new interactive anatomy resource and study aid free for medical students and all people interested in science [registration required]. An intuitive website design allows quick access to the anatomical region of interest. Users can turn labels on or off while studying, and a zoom function allows image magnification. A testing feature allows users to drag and drop labels onto the anatomical illustrations while being timed. Users may view test results instantly to measure their proficiency of the material and compare scores with other users! Click the link on the right of the Library Home page, under News & Events to access the latest ARL Resource Sheet: Infectious Diseases, which provides current information and key links on this new virus, as well as other infectious diseases.